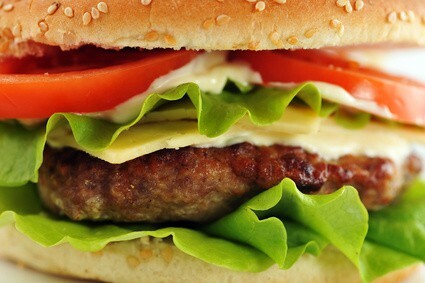 Did you know going to a fast food burger place can have up to 40 grams of fat in the burger? Instead of going through the drive thru come home and make this All American Cheeseburger for only 8 grams of fat and 340 calories. This cheap healthy dinner can be turned into lunch the next day if you double the recipe or it could also be made and put in the freezer for future meals when you dont have time to make dinner. Enjoy. Mix the garlic powder into the meat. Equal divide the meat into 4 patties. Heat a grill pan to medium high heat. Place each patty on the grill pan for 5 minutes. Then flip over for another 5. After the meat is cooked thoroughly place a piece of cheese on top of the patties. Then cover the pan for 3 minutes or until the cheese is melted.